I have a love for wooden furniture. Actually for all things made of wood: wooden toys, wooden beams (love the beams in the left image below), wooden home accessories .. I can go on and on. All these inspiring images are from Danish magazine Rum. I’m wishing that I could buy this mag here in The Netherlands! 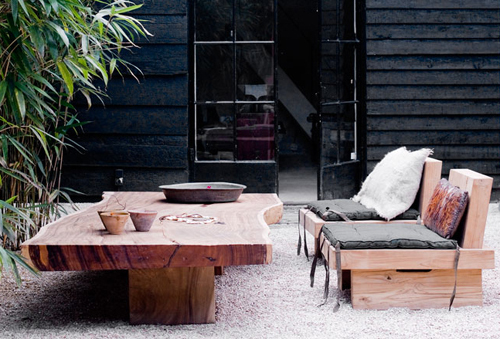 Isn’t the rustic outdoor table in the image above simply gorgeous?! I’m like that as well. Wood, feels homey, earthy…I believe it’s part of where we came from. Wood toys are way better than the plastic once, or at least that’s my opinion :p I was just looking at some the other day, pricey but worth every penny. i love wooden furniture too. and the chairs in the last one! Wood furniture has so much character especially if the grain is visible. These pieces are wonderful especially the pieces featured in the last photo. That table has such beauty and an interesting look. the picture with the wood flooring + wood ceiling structures is gorgeous! coupled with wood furniture? talk about serenity….. i already feel at home just looking at the images. Oh, yes, the table is perfection. Agree with your sentiments on wood. Thank you for sharing these amazing shots. I love wood furntiure, too. One of the best wooden furniture i have seen its really awesome!! Wow This Furniture is really good and very comfortable…. Thanks for sharing your best products. Real wood furniture is made to last. Nothing compares to the beauty and style of rustic furniture. Thank you for the wonderful post! pls send me wooden beds designs to select better furniture. I love wood furniture. I have those on our backyard.